A review of his biography here. A discussion of one of his talks here. If you have any recollections of experiences with Elder Perry or thoughts about his talks, you are welcome to share them here. (Here’s a fun one from Daniel Peterson.) I had no personal experience with Elder Perry, but my husband still remembers Elder Perry visiting the MTC at Christmastime and visiting with the missionaries while wearing a Santa hat. This will be a eulogy thread–not the place for criticism. Please observe that. He is the only general authority I’ve seen deliberately seeking out the public. Every once in a while — not often — he went to the cafeteria in the Church Office Building and walked around shaking hands and talking to people. They might be obviously important men in suits, or elderly women in t-shirts that identified them as patrons of the Family History Library, or members of the grounds crew who still had grass clippings in their pants cuffs — didn’t matter. He walked around greeting everybody with a handshake and a few words, and that big ol’ grin that shows in the picture you’ve chosen. He came and spoke in Manti at a Mormon Miracle cast devotional. He stood and immediately declared, in customary Perry drawl: “the Book of Mormon is the word of God!” Such a powerful testimony that I’ll always be grateful for! What a wonderful person. We met Elder Perry in 1983 when he came to dedicate PNG for the preaching of the gospel. Late in the afternoon along with the fledgling membership we ascended the hills overlooking Badili and Koki Bay in Port Moresby and there he offered the Dedicatory Prayer. It was daylight when he began and dark when we opened our eyes. We were invited to dinner and spent a warm evening with his wife, himself and Elder H Burke Peterson. From that day in April with only a few hundred members, the membership in PNG has grown in excess of 22,000. Elder Perry toured the Belgium Antwerp mission in 1978 or 1979 while I was serving in Belgium as a missionary. As I recall, Sister Perry accompanied him. I remember three things he said. First, he noted the large difference in height with his wife, but then said that it worked fine while the two of them worked in the yard, because he would handle things far from the ground, while his wife would take care of things closer to the ground. Second, Elder Perry commented that the Church needed one convert in the United States for every two (or three or four — I forget the exact ratio) converts outside the United States. At the time, I was taken aback by this crass number crunching, but I now realize that this was part of managing the growth of the Church and tendering its resources. I was an EMT at BYU and was once assigned to be stationed on-call at the MTC to cover the seminar for new mission presidents. Someone told us we could go get lunch from a buffet line, and while grabbing some items I realized I was standing right behind Elder Perry. He turned around and told me, “You should try the yogurt, it’s really good.” That was all he said, but it was the only time in my life I’ve received apostolic instructions given just for me, so I made sure to obey with exactness! Yesterday, shortly after 2:00 PM, I gave the closing prayer at a Blazer (OK _ 11 yr. old scouts) Day Camp. 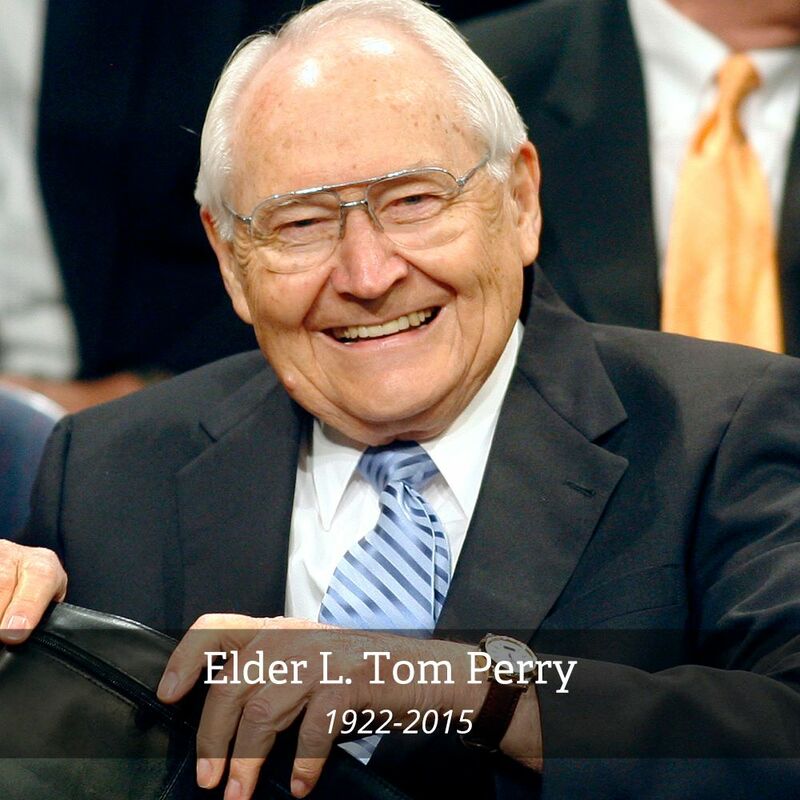 Aware of the terminal cancer announcement, I prayed for those that would be mourning Elder Perry. Little did I know he would be gone less than an hour later! Elder Perry visited our mission in Brazil while I was there. I still remember the complete silence when we all stood as he entered the chapel for our mission conference. The silence was promptly broken by Elder Perry stopping to talk to missionaries along the way and shaking hands with a bunch of elders and sisters on his way to the podium. His friendliness and enthusiasm stood out the most to me. He then proceeded to give a wonderful lesson applying the principles of a motion offense in basketball to missionary work, and how we can apply those same principles when trials come upon us in our own life. Not the most theologically deep lesson, but a very practical one for sure. I’ve met four different apostles in my life, but that experience was the most memorable of any of them. Elder Perry was my great uncle. He would occasionally come visit while on vacation and I remember one time visiting his apartment in Salt Lake. Mom would always go into a tizzy of making sure everything was neat and that everyone was dressed in clean, nice clothes. He was, quite literally, always happy and smiling. I loved the positive way he spoke concerning the gospel, focusing on it being a positive influence in our lives, and not something to be endured. My favorite memory is when he did the sealing for my cousin and her husband. At the luncheon after I ordered Dr. Pepper, just like always. When the waitress came back and asked, “Who had the Dr. Pepper?” Uncle Tom piped up and said, “Who ordered Dr. Pepper?” Mom was mortified. I don’t think Uncle Tom cared, and I thought it was hilarious. He was 6’4″ to my understanding, PangWitch.